A local Indian bank got a series of complaints about one of its ATMs. The cause of its sudden malfunction is quite unsettling. Just thinking about this story alone sends shivers down our spines. What you are about to read will definitely give you quite a shock. 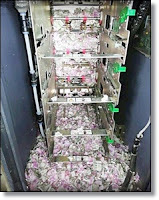 In the Tinkusia district, located in the Eastern state of Assam, India, an ATM was starting to act a bit askew. Countless people were soon left with empty pockets when the machine simply just wouldn't shoot out any more cash. After a series of complaints from the bummed out ATM users, the bank's officials decided it was time to figure out exactly what was going on. If you thought the ATM was robbed bone-dry, then guess again. Instead, it was a family of squeaky rats that had made their way inside the machine. 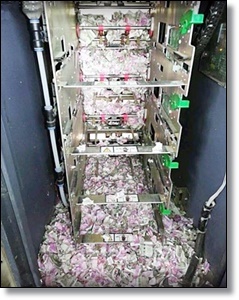 The wily rats had proceeded to nibble through banknote after banknote, destroying a whopping amount of roughly 1.2 million rupees, nearly $18,000. The gobsmacked bank employees even found a rotting dead rat at the scene of the crime. You can see in the photos of what a few destructive rats can do over a short period of time.